A young boy is dropped off at an orphanage while his guardians leave to fight for the rebels in the Spanish Civil War. Once there, he begins to see the ghost of a young boy, which eventually leads him to uncover a sinister plot by one of the orphanage employees. "What is a ghost? A tragedy condemned to repeat itself time and again? An instant of pain, perhaps. Something dead which still seems to be alive. An emotion suspended in time..." This opening quote drives the entire theme of Guillermo del Toro's historical ghost story "The Devils' Backbone." 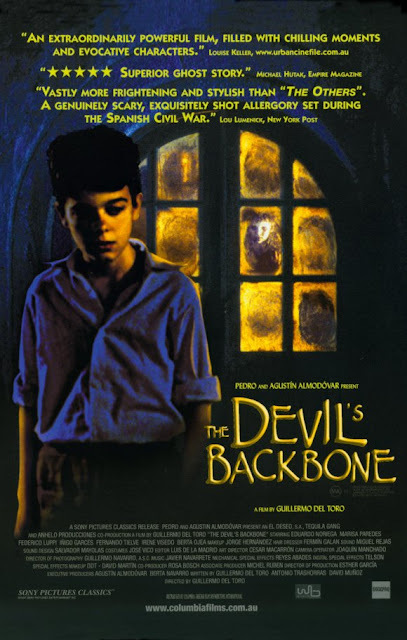 The film follows a young boy named Carlos, played by Fernando Tielve, who, after his tutor drops him off at an orphanage, begins seeing the ghost of a young boy who died there. Jaime, played by Íñigo Garcés, an older boy at the orphanage, gives Carlos a hard time upon his arrival and even pulls a knife on him at one point. Most of the adults at the orphanage have the kids' best interests at heart, except Jacinto, played by Eduardo Noriega, who grew up in the orphanage and now works there as an adult. He is only interested in himself and the gold that Carmen, played Marisa Paredes, the woman who runs the orphanage, is rumored to be holding for the rebels fighting in the Spanish Civil War. Jacinto will stop at nothing to get the gold all for himself. This film is a period piece drama with a half-horror twist. Not only is it scary at some points, but it has an interesting story to go along with it. The ghost element is extremely engaging and intertwines very well with the drama of the sinister Jacinto and his desire to find the hidden gold. The ghostly storyline also acts as a metaphor for the Spanish Civil War. As we mentioned, the movie references a ghost being "an emotion suspended in time," much like the unexploded bomb that sits in the front courtyard of the orphanage. The rage it took to drop the bomb and the fact that it will remain there as a reminder of that anger long after the fighting has stopped. This is a very powerful, extremely haunting notion. The makeup work is really great, though this is not the type of story that needs a ton of it since the ghosts aren't the central focus of the film. There are some gruesome death scenes, but nothing like what you'd see in a traditional splatterhouse horror film. This is not the scariest horror movie you'll see, but it is a beautiful, tragic, eerie story about life, loss, and war, complete with lots of strong emotion. Guillermo del Toro is a fantastic director, and he puts a lot of attention into the small details when he makes his films. He also puts his heart and soul into each picture he crafts, and that has never been more apparent than it is in "The Devil's Backbone."